We didn’t have very many new potatoes this year so those that made it into the pot were treated like gold. We planted them, as normal, on 17 March – the traditional time in Ireland for planting the spuds, as far as I know, especially when they’re earlies – but the weather was nasty after that so I think more than a few simply rotted in the ground. Between that, the terrible summer, the death of our cat and subsequent rise in the bunny population (we must not have been eating enough Rabbit Stew) it hasn’t been an entirely successful summer in the garden. At least we’ve the hens to keep us fed and entertained, although when the weather was absolutely appalling there, last month, they seemed to go through a bit of a depression, egg laying dropping to just one per day. Fortunately they’re now back up to a three-a-day average – making a lovely accompaniment to the few potatoes that we managed to salvage. Supper ideas last night started with the potatoes and eggs, then I discovered a chunk of Gubbeen chorizo lurking in the fridge door so I went off on a warm salad direction. Unfortunately, my timing of the poached eggs did not coincide with the Husband’s readiness for dinner so they’re a little overdone, unlike Sarah‘s fantastic-looking ones. The measurements I give for the olive oil and sherry vinegar are very approximate – toss the salad, taste and see if you need any extra. A lot depends on the amount of flavoursome fat that your chorizo gives off as it fries. Chop the potatoes into bite-sized pieces, put into a saucepan, cover with cold salted water and bring to the boil. Simmer until tender, for about 15 to 20 minutes, drain well and put into a large bowl. Remove any waxy paper from the chorizo, cut into half and slice into pieces about ¼cm thick. Heat a frying pan then dry fry the chorizo over a medium heat until it gives up its fat and is is starting to turn dark. Add the olive oil and sherry vinegar, stir well then pour over the cooked potatoes. Toss with the spring onions and parsley and season to taste. Divide between two plates. 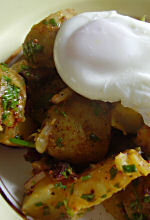 Meanwhile, poach your eggs and place one on top of each potato-chorizo portion. Serve immediately!